It has become widely known that Carrier Aggregation on LTE increases dramatically speeds on downlink but now it is also possible on uplink. 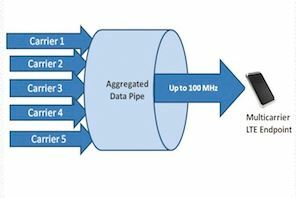 China Mobile and Huawei jointly completed the world’s first uplink CA (Carrier Aggregation) field testing and validation using Jiangsu Mobile’s commercial network. The test included uplink CA and 64QAM (Quadrature Amplitude Modulation) and the report showed a 180% increase in uplink rate, which could greatly enhance the user experience when using upload services. This validation effectively demonstrates uplink CA’s performance in a live network environment and brings it one step closer towards actual commercialization. Uplink CA is a key LTE-Advanced technology and can dramatically increase uplink data rate. Practical applications include but not limited to pictures and video sharing by individual users, as well as video surveillance, telemedicine, and shoot-and-transmit for enterprise users. Fully considering network evolution, Huawei uplink CA solution can easily be adopted using a simple software upgrade, effectively eliminating the need for operators to purchase additional equipment. Besides this uplink CA verification, China Mobile has already started upgrading the entire network in Shenzhen to TDD LTE-A by enabling the downlink CA.